Coins of this series first appeared in 2007 and feature obverse portraits of the former Presidents of the United States. The coins are released in the order in which the individuals served meaning the first strike of the series was the George Washington Presidential $1 Coin. Strikes of the program are issued at a rate of four per year until all of the qualified individuals have been honored by a coin. Grover Cleveland ushered in a new philosophy during his first term not typically seen in previous administrations. A majority of his political appointees were chosen based on merit instead of political patronage. He even went so far as to keep appointees from the previous administration as long as they were thought to have been doing a good job in their post. This philosophy even won him the support of many Republicans despite him being a Democrat. In fact, he was the only Democrat to serve in the office during a reign of Republican power following the American Civil War which lasted from 1860-1912. 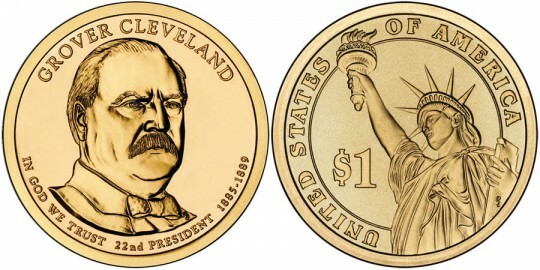 Shown on the obverse of the coin will be a portrait of Grover Cleveland. 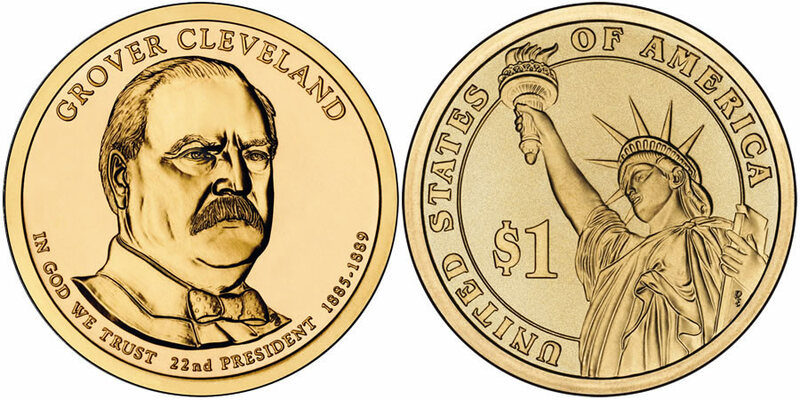 Obverse inscriptions include "GROVER CLEVELAND," "22ND PRESIDENT," "1885-1889" and "IN GOD WE TRUST."